Kids need great poetry. Poetry that catches them up in its rhythm and helps them see the world through fresh eyes. But finding it isn't easy. 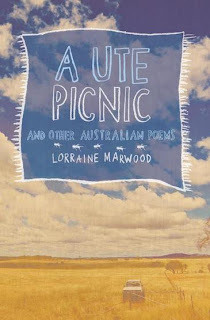 That's why I'm so excited about A Ute Picnic and Other Australian Poems, written by Lorraine Marwood and published by Walker Books (2010). These poems will make kids grin, wonder, empathise and understand. They'll relish the excitement, the drama, and the satisfaction of life close to the earth. They'll giggle over images like "goanna, a skinny pram on early summer wheels" and with luck, race to create unique images in a poem of their own. If you're looking for a Christmas gift that celebrates the real Australia and a love of language, look for A Ute Picnic. If you need a resource for your library that will enthuse kids about poetry, try A Ute Picnic. And if you want a book to send overseas, one that captures the essence of Australian country life, take my advice and grab this delightful book. I love it! There are a lot of rhyming books for kids but not many dedicated poetry books so this is interesting. Love the title too. It's great, Kelly! I love rhyming picture books, but it's not easy to find poetry of this quality written especially for kids. Check out Lorraine Marwood's website too - all sorts of goodies there! Thanks - I'm on the lookout for clever o/s gifts right now. This is certainly worth a look! It will make a very special gift for friends over seas, Jeanne!